Throughout the history of ASL, its “official” publishers (first Avalon Hill, then Multi-Man Publishing) have relied on third party publishers for material to buttress their own original designs. 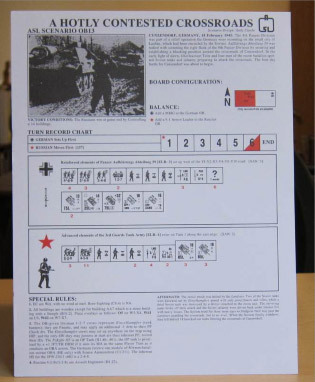 Third party scenarios have been reprinted in virtually every periodical with “official” ASL material, the HASL module Blood Reef: Tarawa originally appeared as a third party product, and MMP has even published Out of the Attic and Out of the Attic 2, dedicated to reprinting third party scenarios. 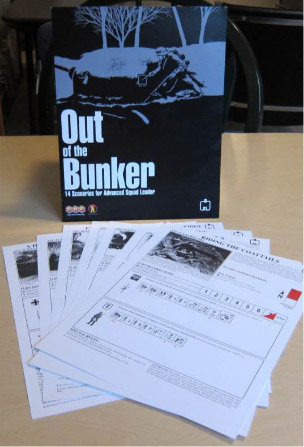 However, MMP’s new scenario pack, Out of the Bunker (OotB), is the first time that they have dedicated a scenario pack solely to reprinting scenarios from a single third party publisher. In this case, the publisher is the long-running ASL newsletter Dispatches from the Bunker, edited by Vic Provost. 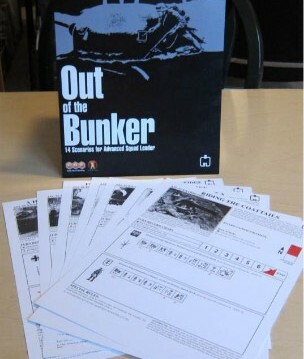 Several individual Dispatches scenarios had previously been reprinted as official ASL scenarios, but OotB is a unique achievement. Many ASLers will never have encountered these scenarios before. Even for those who already have the original scenarios, the OotB scenario cards, with their official layout style, are far more user friendly than the original boxy, hard to read versions. Moreover, some of the scenarios have been updated to address balance issues (though the pack does not state which ones). Dispatches scenarios tend to be grouped together in a variety of themed “series,” some very loose in nature and others more narrowly focused. The OotB scenarios, borrowing from any and all series, collectively represent a mixed group of actions that span years, theaters, and nationalities. Included are actions featuring Poles vs. Slovaks (Poland 1939), French vs. Germans (France 1940 [2 scenarios], France 1944), New Zealanders/Partisans vs. Germans (Crete 1941), Soviets vs. Germans (Soviet Union 1941, Germany 1945), British vs. Germans/Italians (Tunisia 1942), Americans/French vs. Germans/Italians (Tunisia 1943), Americans vs. Japanese (Bougainville 1943 [2 scenarios], Philippines 1945), French Partisans vs. Germans (France 1944), and Americans vs. Germans (France 1944). The scenarios are pretty equally divided between small, medium, and large scenarios, with only one scenario, OB7 (Crisis at Kasserine), being truly large. This 12-turn desert monster features 37 German and Italian squads, with 5 guns and 16 AFVs, attacking a Franco-American position with 14 squads, tons of toys, 10 AFVs, and 2 guns. It is one of two desert scenarios in the pack, the other being the smaller OB6 (First Clash in Tunisia), infamous for using two copies of the same mapboard, Board 25. One scenario, OB4 (Headhunting for Bloody Huns), uses Air Drop rules. Two scenarios have OBA; one has a Bombardment. No scenarios use Air Support or Night rules. Several scenarios are SSR-intensive. Two scenarios, OB4 (Headhunting for Bloody Huns) and OB10 (The Men from Zadig), are DASL scenarios. One scenario, OB8 (Unhappy Trails) is potentially a two-part scenario. Players start with Part 1, but if the Americans do not fulfill their victory conditions, the two sides proceed to play what is essentially another scenario, Part 2, to determine the victor (though the VC do not explicitly spell this out, the Japanese cannot win Part 1, they can only prolong the contest into Part 2, which they can win). The scenarios represent a fun and interesting collection of actions. Most of the scenarios were originally well-balanced to begin with; the tweaking of several of the reprints presumably fixes those few that were not. In particular, OB1 (Riding the Coattails), OB6 (First Clash in Tunisia), OB9 (First Crack at Hellzapoppin’ Ridge), OB11 (Avril Action), OB13 (A Hotly Contested Crossroads), and OB14 (Pursuing Kobayashi) are likely to prove popular. This is a very solid reprint pack that provides good play value for dollars spent. One hopes that this experiment might be repeated in the future, as the ASL world could do with some more of these reprint packs, especially from third party possibilities such as Friendly Fire, East Side Gamers, Schwerpunkt, and Le Franc Tireur, although some of these would be far less likely to occur than others.